Everything about Clash Royale Cards is here! In Clash Royale, using Cards are the only method for deploying troops. Clash Royale Cards can be obtained by buying with Gold or found in Chests. Duplicate cards obtained will fill up an upgrade meter, once the meter is full, you can upgrade the card with coins. There are 4 levels of rarity, Common signified by blue, Rare signified by orange, Epic signified by purple and Legendary signified by rainbow. Currently there are 82 Clash Royale Cards in total. There are 3 types of cards: Troop, Spell and Building. This guide will be giving a brief explanation of all terms/classification related to Cards in the game which many players use on CRA, Reddit, YouTube and other sites. This will help all readers to understand the guides in better way as well help them in building decks. Many Clash Royale cards fall other 2 or more classes due to their versatility. So, don’t consider this as a mistake. The cards are allotted to a specific class based on the extent of their ability to perform the role of the given class. The new cards which are not released are not included in this guide because we don’t know how they perform and haven’t used them. So mentioning them will be speculation. And few may perfectly fit in a particular class like Flying Machine does in Air Troops but still I won’t mention them. AoE: AoE means the Area of Effect. This class includes all cards(troops, spells as well as buildings) which deal area damage. It is generally recommended to have at least 2 such cards in each deck. Win-Condition: This class includes all cards which are the major source of damage in the decks they are used. You will be using them all the time and your whole deck will be based around these cards. The Win-Conditions are Giant, Goblin Hut, Goblin Barrel, Giant Skeleton, Balloon, Barbarian Hut, Rocket, X-Bow, Hog Rider, P.E.K.K.A., Lava Hound, Graveyard, Mortar, Battle Ram, Golem, Miner, Sparky, Royal Giant, Elite Barbs, Three Musketeers. Win-Condition Support: This class includes cards which will be the main-support to your Win-Conditions. You will be using nearly always in your pushes. These are form the core of your deck along with Win-Conditions. These include Prince, Baby Dragon, Witch, Freeze, Poison, Dark Prince, Princess, Bowler, Executioner. Spawner: This class includes cards which spawn other troops. If they are on the map for a specific amount then give far better value by the amount of troops they spawn. They generally annoy people as you have to counter many waves of cards. These include Witch, Goblin Hut, Tombstone, Barbarian Hut, Furnace, Night Witch. Tank-Killer: This class includes cards which have the ability to kill Tanks due to their high damage. Every deck should have at least 1 such card while 2 are recommended for better defense. These include Mini P.E.K.K.A., Skeleton Army, Bomb Tower, Cannon, Minion Horde, Tesla, Inferno Tower, P.E.K.K.A., Inferno Dragon, Lumberjack, Night Witch. Tank: This class includes troops with very high HP. These have 2000+ HP at Tournament Standards. They are generally used as Win-Conditions however, in some they are also considered as Threat Their main aim is generally to act as a shield and absorb damage for other troops. 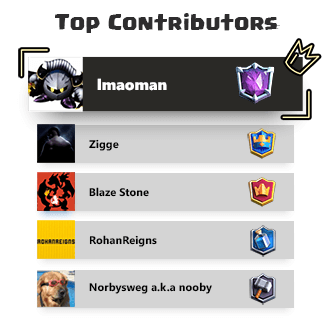 These include Giant, Giant Skeleton, P.E.K.K.A., Lava Hound, Golem and Royal Giant. Mini Tank: This class includes troops with moderately high HP. They perform the role of a Tank to a limited extent. They may or may not be Win-Conditions. These include Knight, Prince, Valkyrie, Balloon (some extent), Hog Rider, Miner, Dark Prince (due to his shield), Ice Golem. Splash Troop: This class includes all AoE They deal area damage and when used properly give lot of value. It is recommended to have at least 1 such troop however, decks work without 1. These include Bomber, Baby Dragon, Witch, Valkyrie, Fire Spirit, Wizard, Ice Wizard, Dark Prince, Princess, Ice Spirit, Bowler, Dart Goblin, Executioner. Glass Cannon: These cards with low HP so they can be killed easily i.e. like ‘Glass’ but they deal high damage and can be punishing if protected like ‘Cannon’ thus giving them the name Glass Cannon. 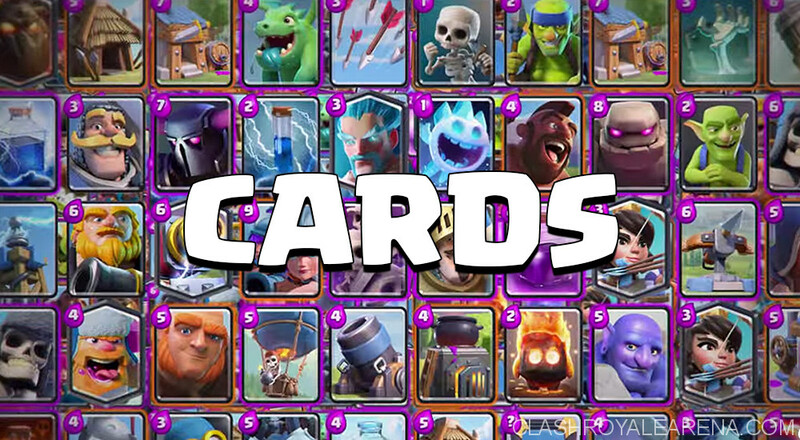 These include Musketeer, Wizard, Mega Minion Electro Wizard, Lumberjack, Night Witch, Bandit, Flying Machine. Air Troops: This class includes which fly. They have a advantage because ground troops cannot target them. It is recommended to at least have 1 but decks work fine without it. These include Baby Dragon, Minions, Balloon, Minion Horde, Lava Hound, Inferno Dragon, Mega Minion, Bats. Air Targeting Troops: This class includes troops which have the ability to target air. It is recommended to have at least 2 in a deck. These include Archers, Musketeer, Baby Dragon, Witch, Spear Goblins, Minions, Minion Horde, Inferno Dragon, Fire Spirits, Wizard, Ice Wizard, Three Musketeer, Mega Minion, Princess, Electro Wizard, Ice Spirit, Bats, Night Witch (only by her spawned bats), Goblin Gang (only the Spear Goblins), Dart Goblin, Executioner. Multi-Unit Cards: This class includes Clash Royale cards which deploy more than 1 unit when used. These offer lot of versatility because they can be split and can be used to distract Single Target troops. These include Archers, Skeleton Army, Goblins, Spear Goblins, Skeletons, Minions, Barbarians, Minion Horde, Fire Spirits, Elite Barbarians, Three Musketeers, Guards, Bats, Goblin Gang. Swarm: This class includes Multi-Unit Cards which deploy many units when used. These have a high DPS due to high no. of troops and can used to surround troops in order to kill them. These include Skeleton Army, Barbarians, Minion Horde, Goblin Gang. Cycling Cards: This class includes cards which have a very low cost (1 or 2 elixir). They are used to quickly move forward in your card cycle so that you get a particular card once again. They also help to lower the Average Elixir Cost of your deck. These include Goblins, Spear Goblins, Skeletons, Fire Spirits, Ice Spirit, Bats. Melee Troops: This class includes troops which attack other troops at a close range. They need to be very near the troops in order to deal damage. These include Knight, Prince, Goblins, Valkyrie, Skeletons, Minions, Giant Skeleton, Barbarians, Minion Horde, P.E.K.K.A., Miner, Elite Barbarians, Mega Minion, Guards, Dark Prince, Bats, Lumberjack, Night Witch, Goblin Gang (Goblins only), Bandit and all Building Targeting Troops (other than Royal Giant). Ranged Troops: This class includes troops which attack from a long distance which varies from troop to troop. This enables them to take down troops even before they reach the troop. Their range also enables them to pull troops towards them. 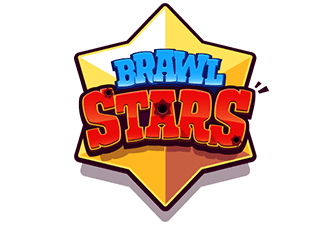 These include Archers, Musketeer, Baby Dragon, Witch, Spear Goblins, Inferno Dragon, Fire Spirits, Wizard, Ice Wizard, Sparky, Royal Giant, Three Musketeers, Princess (longest range), Electro Wizard, Ice Spirit, Bowler, Goblin Gang (Spear Goblins only), Dart Goblin, Executioner. Building Targeting Troops: This class includes troops which target only buildings. These are great Clash Royale cards as Win-Conditions because they go straight towards Crown Towers unless distracted by buildings. This also is disadvantage because they aren’t that effective on defence because they can’t damage other troops. However, they are great as a distraction, damage absorption and kiting/pulling. These include Giant, Balloon, Lava Hound, Battle Ram, Golem, Royal Giant. Troops with Special Attribute: This class includes all troops which have a special attribute. These attributes include charge, dash, slowdown, stun, pushback, spawning and shield etc. They have a bit edge over other troops due to these attributes. These include Prince, Witch, Inferno Dragon, Ice Wizard, Battle Ram, Miner, Guards, Dark Prince, Electro Wizard, Bowler, Night Witch, Bandit. Troops with Death Effect: This class includes all troops which have a special effect after death. These effects include Death damage, Death bomb, Slowdown, Spawning Troops, deploying spells etc. These include Giant Skeleton, Balloon, Lava Hound, Battle Ram, Golem, Ice Golem, Lumberjack, Night Witch. Damage Dealing Spells: This class includes all spells which deal damage. They can give a lot of elixir advantage if used properly. These include Arrows, Fireball, Lightning, Rocket, Zap, Poison, Tornado, The Log. Non-damage dealing spells: This class includes all spells which do not deal damage. It doesn’t include Troop Spawning Spells which deal damage through the spawned troops. These include Rage, Freeze, Mirror, Clone, Heal. Troop Spawning Spells: This class includes the spells which spawn troops when deployed. They deal damage indirectly through the spawned troops. This also means that there isn’t a guarantee of dealing damage. These include Goblin Barrel and Graveyard. Buffers: This class includes the spells which strengthen your push. They are also considered as ‘Over-win’ cards. These include Rage, Clone, Heal. Cheap Spell: This class includes spells which have a low cost and deal low damage. It is necessary to have at least 1 in a deck. These include Arrows, Zap, The Log, Tornado. Medium Spell: This class includes spells which have a medium cost and deal moderate damage. They take care of many troops if coupled with a Cheap Spell. These include Fireball and Poison. Heavy Spell: This class includes spell which have high cost and deal high damage. Only few troops can survive a hit from them and their high damage makes them great tower finishers. These include Lightning and Rocket. Active Buildings: This class includes all buildings which deal damage directly. They are generally used as an answer to opponent’s cards. They also include Tower Damaging Buildings. These include Bomb Tower, Cannon, X-bow, Tesla (disputed), Inferno Tower, Mortar. Passive Buildings: This class includes all buildings which do not deal damage or deal it indirectly through the troops they spawn. They are mostly used as passive plays to make the opponent react. However, they can also be used as answer to opponent’s cards. These include Goblin Hut, Tombstone, Barbarian Hut, Furnace, Elixir Collector. Tower Damaging Buildings: This class includes buildings which directly damage opponent’s tower from your side of the map due to their long range. They are generally considered as Win-Conditions. These include X-bow and Mortar. Spawner Buildings: This class includes buildings which spawn troops. They give a lot of value if they survive the entire life-time. They are pretty annoying to deal with as they give waves of troops and not a particular push. These include Goblin Hut, Tombstone, Barbarian Hut, Furnace. That’s all folks! Hope you guys enjoyed reading my quick guide about Clash Royale cards. Please forgive me if I forgot to mention a particular card in a particular class. Ask me about anything in the comments section below or on Discord. This Clash Royale Cards page is still being updated!